I’ll bet you were wondering what happened to last week’s edition of thegrambler.com (the world’s greatest ill-informed blog). Oh, you weren’t. Well, I’ll explain, anyway. Any road up, it turned out that the charger was, what we technophiles call, f***ed. What this meant was that my laptop couldn’t be used until I could get hold of a charger to give it a bit of power. Unfortunately, last week’s edition, which I had almost completed, was stored on the, now very dead, laptop. No need to panic; surely somebody I knew would have a similar cable that I could borrow while Azamon were processing my order for a replacement. Unfortunately not. It seems that laptop manufacturers persist in using all kinds of connectors for the chargers, which seems a bit daft considering the same manufacturers have seen sense and standardised their mobile-phone charger connectors. I don’t suppose logic enters into these matters if there is a chance that someone, somewhere, can make a fast buck. The new charger finally arrived on Monday thanks to me being able to get somebody to order it using Azamon Primo I think it may or may not have been called. (thanks G). Actually, I’ve got a bit of a gripe about that. Azamon guarantee next day delivery if you sign up (and pay lots of money for) this useful option. Sounds great. Only, it’s not. You see, you may only use this express service on selected items. Thus, I chose a charger. It cost something like 10 quids plus three quids post and packing. Not available with Primo. I chose another unit. 13 quids plus post and packing. Not available. I chose another cable. By this time the price had leapt to 18 quids. No matter, at least it was available with the speedy delivery option. Except it wasn’t. There would be none in stock until the middle of January. I think my next-door neighbours might have been wondering at this point why there were screams of anguish coming from my house. Okay, one last try. Finally, I found a charger that was available with the next-day option and it was in stock. Yay! No, not yay. It cost 20 quids! Twice as much as my original choice which was, basically, the same item. So, this expensive extra that Azamon charge customers to ensure speedy delivery comes at an even higher cost; it would seem that whatever you buy will be considerably dearer than another, standard delivery, item. I reckon it’s all one big con. Incidentally, I have told my tale of woe to one or two folk since I received the new charger. I think you might be able to guess what’s coming. ‘Why didn’t you say? I’ve got a spare charger exactly the same as that at home.’ My neighbours will be wondering about all the screams coming from next door. Okay. Rant over. Let’s get on with this week’s blog. Rather than waste what was written, I have decided to include some of the material that was written for last week’s edition. Thus, there are birthday honours for the 6th and the 13th of January; mainly, because there are some good links in there; it would be a shame to waste them. Well, we are now into what we like to call a new year, though why a random date on a calendar should make us all dewy-eyed beats me. And we do get weepy at this time of year, don’t we? We remember all the things that have happened over the past 12 things that we call months with affection or sadness. The media companies don’t help with all the reminiscing about the previous 52 of the things we like to call weeks. We get big fat quizzes. We get the best sporting moments. We get the top-selling music. We get the year in politics. We see dead people. We get favourite tv moments. We get favourite tv soap moments. We get favourite tv news moments. Basically, anything that has happened in the past 365 things that we sensibly split into what we call days, can have a looking-back tv programme/newspaper article produced about it. The Beeb Beeb Ceeb even had the audacity to show a programme about a family of benefits scroungers. Can you believe that? It was all about this bloke called William, his wife Kate and sprogs George and Charlotte... and there’s another nipper on the way, apparently. Even Googly, the well-known on-line search engine/mega-corporation, got in on the act. They put a short (and schmaltzy) film on line at the end of 2017 highlighting the most popular searches throughout the year. It suggested that the users of the services provided by Googly are intelligent, caring and politically aware individuals. Intelligent? Indeed. The most popular searches were asking pertinent questions such as ‘how do wild fires start?’ or wanting to know ‘how to watch the eclipse’. The users were also concerned about the changes to our climate and the devastation that can be caused by the unusual weather conditions. They wanted to know how hurricanes formed and how to board up a window in the event of one occurring. This also led to the question of ‘how to calm a dog in a storm’. A follow on from such natural disasters was the caring side shown by Googly users... ‘How many refugees in the world’, ‘How to help flood victims’, ‘How to help refugees’, ‘How to help... (insert centre of devastation here).’ Las Vegas, Puerto Rico and Mexico all got mentions. Politically aware? The most common searches according to Googly related to questions asking how far Korean Missiles could travel, how much will the Trump wall cost, how to make a protest sign and how to run for office (It was obviously very US orientated.). To cap it all, Googly search engine users obviously want to become better individuals and asked ‘How to be a strong woman’. Or good parent. Or fearless. It is quite uplifting to learn that Googly users are such wonderfully caring individuals. They must be. These are the most popular searches. Aren’t they? Of course they are. Googly told us in a cheesy little film. I thought I would check out these claims. If, as Googly point out, these are the most popular searches of the year, then, if I type in the first couple of words ‘how to’ or ‘how many’, the first answers to show up will be those given above since they are the most frequently searched for. That is how Googly works. How does - NowTV work. How much - is Amazon Prime. How many - pounds in a kilo. Now it just seems that everyone who uses Googly is pretty much thick as mince... How many inches in a foot? Ye gods and little fishes! How far - I’ll go chords (Back to that bl**dy song. Apparently, it’s from a Disney film.). What does all this prove? Nothing other than Googly are trying to con us with false information. Surely not, I hear you exclaim. Are you suggesting that Googly manipulate information to suit whatever message they are trying to get across, you might be saying. You probably aren’t, but you might be. If you are, the answer is yes, I bl**dy well am. How else do you explain the fact that for one day and one day only, no matter what I searched for, the top answer given by Googly was an advert for a Waitrose recipe? Seriously. I have never looked up anything relating to Waitrose. Nor has Mrs G. For a recent blog I looked up Bo Diddley - Waitrose. I looked up Paul Bowles - Waitrose. I looked up... You get the picture. Think I’ll defect to Yaroo or Bling. Talking of search engines, Mrs G was watching Coronation Street, the well-known soap opera, last week and it showed one of the characters using a search engine. What was it called? Yoogle. Not bad. I still prefer Googly, though. Were any famous or notorious people born on the 6th of January? Of course. Here are some I’ve even heard of. Joan of Arc 1412 (The well-known OMD song. ), Jacques-Etienne Montgolfier 1745 (The well-known fly guy. ), Max Bruch 1838 (Composer and conductor. Here’s your first clip of the week. It is the finale to a piece known as Scottish Fantasy. Herr Bruch ‘composed’ it, it says here. ), Alexander Scriabin 1872 (Pianist and composer. Clip number two? Here is Etude Op. 8 No.12... there’s a snappy title... supposedly played by Scriabin himself and recorded in 1910. Not bad quality for a 108 year old recording. ), Tom Mix 1880 (Hollywood’s original cowboy. Mix appeared in 291 films, 282 of which were silent. ), Heinrich Nordhoff 1899 (Engineer who built the Volkswagen company up into one of the world’s biggest manufacturers. ), Loretta Young 1913 (Ectress. Her film career lasted from 1917 to 1953 after which she moved to television. ), John DeLorean 1925 (Engineer who started his own car production company. 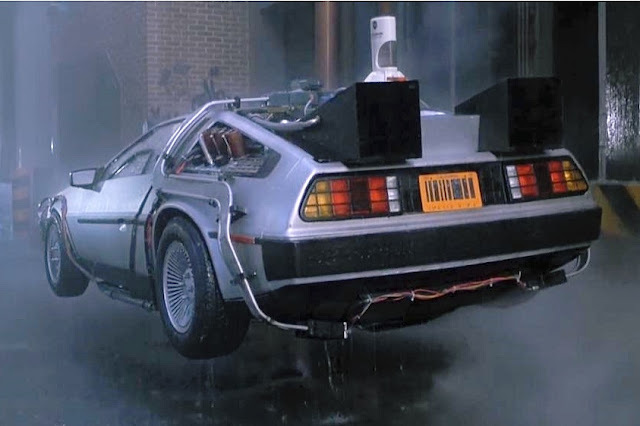 The car that bears his name is now best remembered for its appearance in Back to the Future. DeLorean himself is best remembered for a drugs bust. ), Capucine 1928 (Une actrice. In case you were wondering, that is not her real name. Incidentally, it means nasturtium. Seriously. ), P.J. Kavanagh 1931 (Poet, author, actor, lecturer, broadcaster and columnist. In fact, a right old smarty boots. Trivia: P.J.’s dad, Ted, wrote the I.T.M.A. wartime radio comedies. ), John Clive 1933 (Author and actor. He was a well-known face in many British films of the sixties and seventies. ), Sylvia Sims 1934 (Ectress. Married to Tony Hancock... but only in The Punch and Judy Man. ), Doris Troy 1937 (Singer. Here is her biggest hit, a reggaefied version of Just One Look. ), Van McCoy 1940 (Musician. Ready for another clip? Okay, let’s do The Hustle. And there’s a chance for us blokes of a certain age to see Pan’s People. Yay! ), Terry Venables 1943 (The well-known footy bloke. ), Barry John 1945 (Ruggery gloke. ), Syd Barrett 1946 (Musician. Definitely time for another clip. Here’s an early Pink Floyd hit on a very odd subject... Ladeez and genullum, I give you Arnold Layne. ), Sandy Denny 1947 (Singer. Here’s a track from Fairport Convention, Who Knows Where the Time Goes, with Sandy Denny providing vocals. ), Malcolm Young 1953 (Geetarist. Another clip? Here is AC/DC’s biggest UK hit, Highway to Hell which reached number four when it was re-released in 2013, spoiling the band’s status of having the most chart hits without troubling the top ten. ), Anthony Minghella 1954 (Film director, playwright and screenwriter. ), Trudie Styler 1954 (Ectress. Mrs Sting. ), Rowan Atkinson 1955 (Comedian, writer and actor. ), Justin Welby 1956 (The well-known archbishop. ), Clive Woodward 1956 (The well-known rugby coach. ), Nancy Lopez 1957 (The well-known golfy bloke. ), Kapil Dev 1959 (The well-known crickety bloke. ), Paul Azinger 1960 (The well-known golfy bloke. ), Nigella Lawson 1960 (The well-known chef-type person who can sexualise any vegetable you can mention. ), Eddie Redmayne 1982 (Ectaw, luvvie. ), Alex Turner 1986 (The well-known Arctic Monkey. Time for another clip? Here’s the Monkeys’ first number one. I’m surprised it got to number one; I’d have thought it was more a number two.) and Andy Carroll 1989 (The well-known overpriced, underachieving footie bloke.). Is this car high on drugs? We were pleased that you included a Pink Floyd tune. We have always been big fans. Here’s a teaser for you. What was the band’s only number one single. Anne Udder-Breek, Ian de Waul. Let’s see who was born on the 13th of January. Sophie Tucker 1887 (Ectress, singer and well-known rhyming slang. Here’s perhaps her ‘signature song’, Some of These Days. ), Richard Addinsell 1904 (Composer. Another clip? Here is Warsaw Concerto written for the 1941 film Dangerous Moonlight. ), Ted Willis 1914 (Author, playwright and screenwriter. Gave us Dixon of Dock Green. Mind how you go. ), Robert Stack 1919 (Ectaw. He was one of The Untouchables, you know. [Well, you don’t know where he’s been. - Ed. ]), Roland Petit 1924 (Little ballet dancer. ), Michael Bond 1926 (Paddington’s creator. ), Joe Pass 1929 (Jehhhzzz guitarist. A clip? Why not. Here’s Satin Doll. ), Ian Hendry 1931 (Ectaw. Factoid: he was the main star in the original series of The Avengers; Patrick McNee co-starred. ), Daevid Allen 1938 (Musician. Co-founder of Soft Machine and Gong. Time for another clip. What’s that flying up there? Is it a bird? NO! Is it a plane? NO! Is it ... a teapot??? ), Tord Grip 1938 (Footy bloke with a brilliant name. ), Peter Simpson 1945 (Footy bloke... with a rather dull name. ), Trevor Rabin 1954 (Geetarist. And the next clip is... Owner of a Lonely Heart. He is the giant standing in a ditch to the right of Jon Anderson who appears to be standing on a mound... Rabin is still taller than Anderson! ), Mark O’Meara 1957 (Golfy bloke. ), Matthew Bourne 1960 (Ballet bloke. ), Wayne Coyne 1961 (Musician. Vocalist with the Flaming Lips. Here they are (with a bit of help from the Chemical Brothers) with The Golden Path. ), Patrick Dempsey 1966 (Ectaw and part-time motor racey bloke. ), Stephen Hendry 1969 (Snookery bloke. ), Mark Bosnich 1972 (Footy bloke. ), Orlando Bloom 1977 (Ectaw. A hobbit and a pirate. ), Katy Brand 1979 (Comedian.) and Ruth Wilson 1982 (Ectress.). Thank you for giving a link to a song by Yes. The song you played reached number one in the US, but only got to number 28 in the UK. Apparently, they only ever had one top ten hit in Britain, but I can’t remember what it was. The hosts took the lead when Lasse Vibe scored for the sixth time in five appearances. Sergi Canos came close to doubling the Bees' lead after the break when his long-range shot went just over the bar. Substitute Lucas Joao's header deflected wide for the Owls before Florian Jozefzoon wrapped up the win with a neat finish late on. Tom Naylor tested Norwich goalkeeper Angus ‘Ben’ Gunn and hit the side-netting, while Kyle McFadzean and Ben Turner also went close for the Brewers. Mario Vrancic forced Stephen Bywater into a save with a free-kick, but Norwich struggled to fashion chances. After an uneventful first half, Jack Grealish and Robert Snodgrass had efforts saved, while Jonny Howson and Patrick Bamford went close for Boro. Villa took the lead when Snodgrass headed in from Albert Adomah's cross. Rovers hit the front with their first attack as Danny Graham met Ryan Nyambe's low cross and his effort was too hot for Matt Gilks to handle. Scunthorpe equalised six minutes later as Kevin Van Veen found space on the right and hammered into the roof of the net. Graham's second arrived in the 47th minute when he swept home a headed cross but Elliott Bennett's poor clearance eight minutes later presented Conor ‘Pinball Wizard’ Townsend with a simple finish. Bradley Dack cut inside late on and his effort beat Gilks, but not the post and neither side could force a winner. Bradford dominated the rest of the first half and only Eastwood prevented the home side from taking a handsome half-time lead as he saved from Taylor, Wyke, Tyrell Robinson and defender Matt Kilgallon. Oxford's best first-half chance came just before the interval when former Bradford loan striker Wes Thomas found himself unmarked in the box but goalkeeper Rouven Sattelmaier came quickly off his line to block his shot. Ho hum. So close to getting four out of five again. No matter. What has The Grambler come up with this week? "I regreh wha happen ah Hiiiighbry chhhuz I leh de chhhlub, de fans, me teeeeem-maes and meself doooown. No marrer whah de physichhhal or viiirbal provochhhation, I shouldna reachhhted lichhhe dah. I wouh lichhhe tew apologiiiise for any fence chhhaused. "I was froostraaateh an dih ih widou tinking in de heeeet of de moment. Anyone whew as seen me play regyewlarly will realiiise it was chhhompletely oura chhhharachhhter bu I'm noh goin tew machhhe exchhhyewses. "I was wrong an as a profeshnal footbaaaall player I shoulda known berrer. Iss a mistachhhe I woh machhhe again." One for dis... sorry... this week? Another London club question. Who was the Tottenham Hotspur chairman who sacked manager, and birthday celebrant... last week, (See if you can spot the bits that were meant to be in last week’s edition.) Terry Venables in 1993? One to ask them down the pub. And finally, Cyril? And finally Esther, I am indebted to Messrs A. Mathews and G. Linehan who created one of the most original sitcoms ever to be shown on British television. To finish this week’s blog, here is an episode of Father Ted. What a coincidence, it features another of last week’s birthday celebrants, P.J. Kavanagh. How fortuitous [Read ‘lazy’. - Ed.] is that? Ladeez and genullum I give you Are You Right There, Father Ted.